Enjoy the finest in Maryland fishing charters on the Chesapeake Bay from Maryland's Eastern Shore! We are located on Hoopers Island, just 40 minutes south of Cambridge, MD! Maryland fishing charters on the Chesapeake Bay, fishing for striped bass (rockfish or stripers), bluefish, croakers, Spanish mackerel, and more! Come to Hoopers Island for some of the best Chesapeake Bay fishing that Maryland has to offer! We offer a number of Maryland fishing options to cater to a wide variety of tastes; from those who like to troll for those BIG Maryland rockfish to those who like to try their hands at light tackle fishing for summer stripers, croakers, and other species! The perfect time to book your Maryland fishing charter depends largely upon the type of fishing you'd like to do! Read further for what you can expect at different times of the year. You can also keep up with all of the latest news by visiting our Maryland Fishing Report page. Late April and early May are the perfect time of year for you if you want to land some of these big Maryland striped bass! Rockfish caught this time of year are 28" in length and up! These Maryland stripers can weigh up to 50 pounds! The law allows one fish per person. We catch these by trolling, using up to 20 lines at one time! It is certainly something to see if you haven't seen it before! Light tackle fishing action on the Chesapeake Bay kicks off in the summer months for Maryland rockfish, bluefish, croakers, and more! During this time period, we use spinning reels, and more hands-on fishing techniques such as chumming, bottom fishing, and using live bait! The striped bass caught this time of year, also known as summer stripers, typically range between 18 and 28 inches in length, and the law allows for two per person. The bluefish caught this time of year are typically 2 to 4 pounds, and the croakers can be up to 18 inches long and 3 pounds! The light tackle action continues through October for the summer stripers and bluefish. The Spanish mackerel also enter into the picture at this time. In the fall months, the big Maryland stripers return to the Chesapeake Bay with a vengeance! We offer Maryland fishing charters on the Chesapeake Bay from Maryland's Eastern Shore, fishing for Maryland rockfish (stripers or striped bass), bluefish, croakers, Spanish mackerel, and other species. In addition to some of the best Chesapeake Bay fishing action that Maryland has to offer, we also offer Maryland lighthouse cruises, floating crab feasts, and trips to various destinations along the Chesapeake Bay! Our boat is 52' long and 17' wide, and certified by the U.S. Coast Guard to carry up to 41 passengers! Our boat can accommodate all fishing groups, large and small. 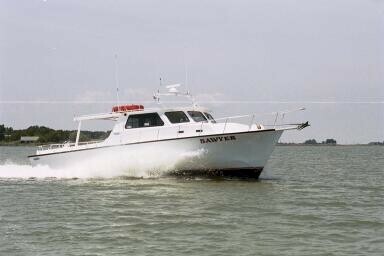 The boat has a spacious cabin, and is powered by two 450-horsepower Caterpillar marine diesel engines to help you get on the fish and around the Chesapeake Bay safely. In addition to this, we also have a Coast Guard award-winning safety record, so you can rest assured that you're in good hands when you're aboard the Sawyer! Regardless of the size of your group, or the uniqueness of your occasion, there is nothing that we can't handle! Join us for a memorable experience on the Chesapeake Bay! 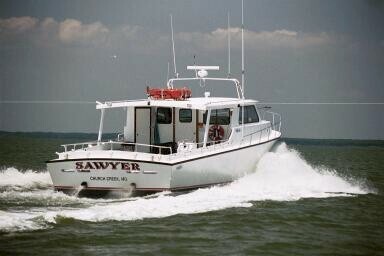 We offer the finest in Maryland fishing charters on Maryland's Chesapeake Bay from Maryland's Eastern Shore! 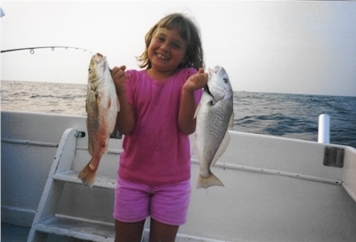 We offer the best Maryland charter fishing experience, fishing for Maryland rockfish (striped bass, or stripers), bluefish, croakers, Spanish mackerel, and more. We also offer Maryland lighthouse cruises, floating crab feasts, and trips to various destinations along Maryland's Chesapeake Bay. There is nothing that we can't handle! Come join us for a wonderful Maryland charter fishing experience!